With an eye on the future, Hero MotoCorp has been steadily supplementing their bread-and-butter motorcycle families with next-generation products. After the Splendors, it is the turn of the premium commuter family, the Glamour. It has been designed and engineered at Hero’s Centre for Innovation and Technology in Jaipur and is another pillar for the company's future growth in India, and around the world. After its global unveil in Argentina we got a chance to sample the carbureted and fuel-injected versions of the all-new Glamour 125. As we got set to ride the Glamour 125, the question right on top was, just how new is it? The story goes, Hero’s R&D team worked behind closed doors for three months to create a design without any interference, and the results speak for themselves. The Glamour looks new and fresh. From the softly flowing lines of the headlamp, the crispness of the tank extensions and the sharp rear cowl, the Glamour’s design has a sense of balance and sophistication that is immediately pleasing. The tank has muscular contours but it isn’t aggressive, so it won't put people off. The chunky side and tail panels also lend this motorcycle some visual mass, and the chequered pattern for the graphics give it a youthful feel, too. The only awkward angle is from the rear three quarters where you can see how the need for a long seat has resulted in the tail section to stick out significantly. The tail lamp sits tucked away under the tail section. It gets a distinctive light signature with LED brake lights flanked by two light bars. The blacked out split-spoke wheels, fork-sliders and the engine add to the sporty look. But the red springs for the rear shocks contrast nicely against this. The instrument cluster is a digital and analogue unit which is easy to read even on the go. On the FI variant of the Glamour, the meter displays fuel efficiency and the mode switch lets you toggle between the trip meter and odo. But, both variants lack a gear position indicator. This 125cc motorcycle packs automatic headlamp on and tubeless tyres as standard. The Glamour 125 will be available in four colour options for the carburetted version and three colours for the fuel-injected variant. The engine is all new, too, and a quick look at the engine clears any doubts - While the older Glamour had a horizontal or “sloper” engine configuration, the all-new motorcycle has a semi-vertical layout. The engine shares its bottom end with the 110cc range but is thoroughly revised to meet the needs of the higher displacement. The 125cc engine makes 11.5 PS of power, a solid 27 per cent more than before. It also makes 11Nm of peak torque at 6500rpm. While the torque is only marginally higher, you have more thrust on offer from lower rpms and is available over a wider spread of the rev range. Basically, better rideability and hence, fuel efficiency. Now, the Glamour is equipped either with a carburettor or with a fuel injector. The carburetted version now uses a more modern CV carb and is equipped with Hero’s i3S idle stop-start system. This helps the Hero return a company claimed 60kmpl, a 3 per cent increase compared to the existing Glamour equivalent. The FI version of the Glamour, despite making do without the i3S system, returns a company claimed 62kmpl. While we can’t vouch for the fuel efficiency figures, after our test ride we can vouch for the engine’s character. Smooth, really smooth. We were testing the Glamour twins on a 2.5km-long race track on the outskirts of Buenos Aires. Despite far from its comfort zone and even in the harshest of downshifts, and periods of hard redlining, there was no annoying buzz to speak of. We rode both variants back to back, and the FI version proved to be just a bit smoother. The story is similar even in the way they perform. The carburetted version has good low speed rideability and gets a spring in its step as you go a little higher up into the mid-range. It is happy to rev, too, but there is a slight drop off in power at higher rpms. Since there is no tachometer its hard to say where exactly, but roughly 1500 rpm from the limiter. At first, the fuel-injected version feels a bit tame in comparison. That’s because once power starts building it is in one clean sweep. There is no surge or dip. It just gets going and doesn’t back off until you hit the limiter. The throttle response feels crisp and direct, too. As a result, the FI version feels just a bit easier to ride. Also, it imparts a sense of technical sophistication that is great to see in this class of motorcycle. The only hiccup was that the Glamour FI seemed to stumble a bit when being lugged between 20- 30kmph in 4th. Hero’s R&D Head Markus Braunsperger assured us that this was because the test bikes in Argentina had been shipped two months ago and weren’t in the latest state of tune. We can’t wait to test the India-spec bike in home conditions to inspect this further. In terms of outright performance, Hero claims a 0-60 time of 5.6 seconds for the FI and 6 seconds for the carb variant. We saw the speedo needle nearing the 100kmph mark repeatedly, but lacked the road to see how much further it could go. Everything. Usually we don’t end up testing a commuter on a race track. Like, never. While the idea seemed ludicrous first, we are glad that we got the opportunity to ride the Glamour on the track. Within the first few laps it was clear that the new chassis and setup was light and flickable, as you would expect from a commuter. Even at a higher pace, the sense of maturity and confidence was quite evident in the Glamour. The chassis didn’t feel flustered through rapid direction changes. Neither did it feel nervous when leaned over. The MRF tyres were grippy and the feeler studs in the footpegs ground out before you got to the edge of the shoulders. All this grip and cornering prowess will help you on the daily commute too as it will make the Glamour safer and easier to ride., To help with braking duties the Glamour will be offered with a disc brake version as an option. First, Hero’s all-new Glamour really is indeed all new. And, secondly, it clearly has a lot of substance. While we rode it on conditions that are far from the typical environment most Glamour customers will ride it in, there is much promise in this package. When it first goes on sale in the first week of February, the new Glamour will sell alongside the existing model. 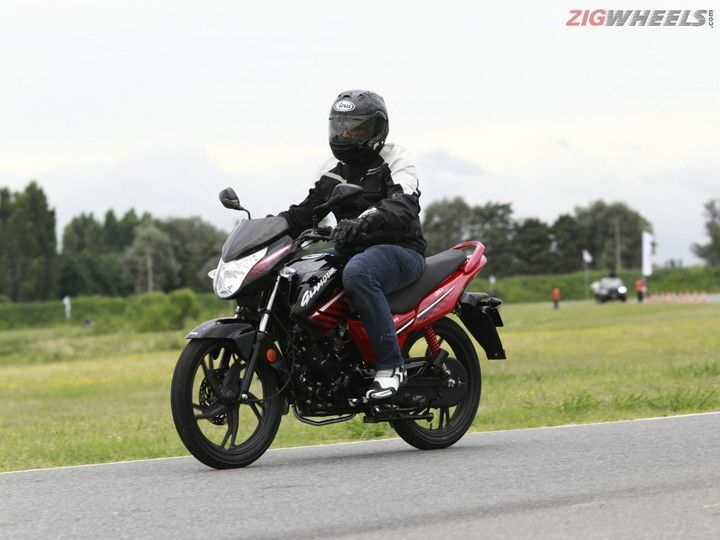 Yes, it will be more expensive, by a just a small margin as Hero wants to tempt customers to step up to the new model as it offers a great blend of comfort, confidence, stylishness and ease of use. For a slight premium over the existing model, the Glamour makes for great motorcycle to have on your shortlist for a sensible and likeable commuter. Confused about Hero Moto Corp Glamour 2017 Edition?